Today I joined Kevin, from Eagle Paragliding, and Brad Gunnuscio at Lake San Antonio to feel out the "Dark Side" of the Avax XC2. I made three tows and was able to do all the normal maneuvers. Here's a quick rundown of the maneuvers accomplished and the behavior of the XC2. First let me say, I'm no skygod or test pilot. I'm just a guy who is upgrading from an Aspen2 to the Avax XC2. Prior to today's flights I had ONE flight of 2 hours duration on the Avax XC2. 1. Asymmetric collapse with riser released: Heading controllable and required one vigorous pump to remove tuck. No dive to control. 2. 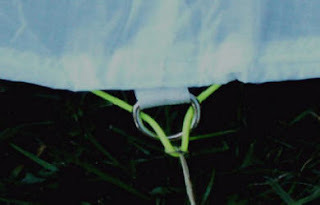 Asymmetric collapse with riser pulled to keep collapse in, allow to dive before wt. shift/control input: Glider turns 90 deg. and dives until control & wt. shift, then responds very quickly with accurate control - even allowing turn into the collapse. No tendency to stall or spin with brake application. 3. Same as (1)&(2) accelerated with 1/2 to full speed bar: Same outcome with just a bit more dive. Even with speed bar held, full control and turns into the collapse were easy. 4. Full Frontal collapse with risers released after collapse: Collapse was swift & complete, with quick, symmetrical recovery after a short "hover" and controllable surge. 5. Full Frontal collapse with risers released after collapse - Accelerated (3/4 bar)and released at collapse: Collapse was swift & complete. The wing has a "hesitation" or "hover" of 2-3 seconds before surging to regain flying speed. This hesitation can be exacerbated if the release of the speed-bar is delayed until the wing is in its retarding stage. The surge is controllable. 6. B-Line stalls: Are easy to apply and the wing breaks well from tip to tip, with good rate of descent. 7. Full Stalls: The wing stalls with deliberate action & with a lot of warning. You need to TRY to stall the wing. When it does go, it falls back farther than the Aspen 2 did (probably due to the additional trim speed.) The high aspect ratio of this wing is evident as it snakes around & attempts to recover. I used a 2-stage recovery that was straight forward & the surge was more dynamic than the Aspen 2, but completely controllable. The third stall recovery wasn't as smooth - it started to surge asymmetrically (due to incorrect inputs no doubt), so I restalled it and recovered normally. I'm rapidly becoming a fan of the XC2. I think my reaction certainly can be attributed 50% to the "It's MY wing SO I LOVE IT Syndrome" but the remaining 50% of my opinion is that of a pilot who felt comfortably at home on the wing after less than 2 hours. Today I flew my maiden voyage on the Avax XC2. I flew in thermic conditions for 1:45 and enjoyed the wing very much. The following notes are offered as a first impression only and are not meant to be interpreted as anything more than my personal impression. I will include the information I look for in a report. My experience with the AvaxXC2 is limited to this flight only and I won’t mention conditions I haven’t experienced. I plan to attend an SIV clinic this week and will report on the festivities. o The Wing came with a std. Gradient cinch bag for the wing and a nice rucksack of a newer design than my Aspen’s Rucksack. The new design is slimmer and taller with a storage pocket that can carry a full flight suit and coat. The top flap protects the helmet. I’m not sure if I’ll continue to use this new sack since my Ram Race Harness is a rather tight fit. o The lines are thin, unsheathed Edelrid Aramid - 1.2mm to .5mm. o The risers are standard Gradient riders thin but robust, with “snap” type brake handle stowage. The main difference is that there is only one speed-bar pully. o I used the same setup on my speedbar (a 3-step UP bar) as I use with the Aspen2 and found no adjustment to the system was necessary. o The speedbar that came with the wing is a simple one bar with a tygon tubing covered loop. I will donate it to a new pilot. o Much has been written about Gradient’s decision to use only one pulley in the speed system. I found the speed system to be the same resistance as the Aspen2 (which has 2 pulleys) and within acceptable strength requirements. I used it much of the day & had no fatigue issues. o Brake toggles are Std. Gradient. They seem to be adjusted properly right from the dealer. o Size 26 (85-105kg) Color Blue/Grey top with std. Gradient Blue under wing decoration. Weight during flight – 102Kg. o 73 cells and 6.38 Aspect Ratio. Weight 5.4kg. o Workmanship is excellent. The micro lines attach to the trailing edge with a doubler. o The Aspect Ratio of 6.38 makes this a bit of a handful to ground handle at first. I found the A&C (Mitsos) method to be slightly less effective due to a tendency for the wing to break & snake if I was heavy handed with the C’s. I expect this to be a temporary problem as I learn more about the wing. o Launch is very Aspen-like. The wing comes up easily and can be stopped accurately with brakes or C’s. Directional control is good. No bad habits. o Landing was very straightforward. The additional glide performance in short LZs will take some getting used to. o This wing is a high aspect ratio wing with crisp handling. I found that the wing was very responsive and reassuring in its response to turbulence. 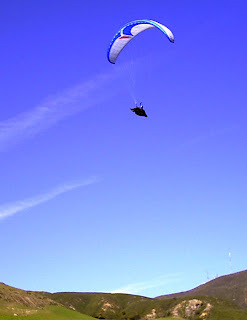 In the 90 minutes I flew the Avax, I felt very comfortable in rough lift and maneuvering close to the terrain. 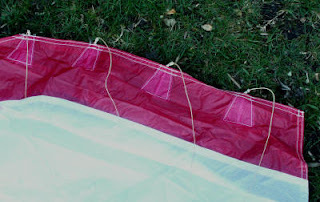 In short, I would fly this wing anywhere that I’d fly the Aspen 2.
o When traversing the edges of strong thermals, I got a couple of small tip-tucks, very minor and quick to come out. The wing never moved out of the safe zone & was very responsive to my inputs. o The wing WAS a bit more ‘twitchy’ than the Aspen 2, but I think much of this was due to my inputs rather than the wing. My habits were for the less responsive Aspen2 so I started the flight overcontrolling a bit. o On the speed-bar the wing felt rock solid. Even more solid, on bar, than my Aspen2. I flew COMFORTABLY on full bar between thermals. It made my eyes water it was so fast (or were they tears of joy?) and the glide didn’t seem to degrade greatly with bar. o Thermalling the Avax is a treat. It doesn’t retard when entering lift, it cuts into the thermal and goes where you tell it to. Banking up to stay in a small thermal is easy and attitude control when banked up is straightforward. When the lift is weak, I found the sink rate in flat, slow, turns to be excellent. o I had only two very small tip tucks – I wouldn’t even call them collapses – and they came out by themselves. The wing is not prone to frontals or loose tips – I flew in many areas where there was shear and the Avax stayed pressurized at all times. I have no performance estimates or reports of recovery from collapses at this point. But, the wing covers considerably more ground than my Aspen2 and scoots! The Avax XC2 is an excellent ‘follow-on’ glider for an experienced pilot who regularly flies a modern DHV 2 wing like the Aspen 2. It has very good handling and is forgiving in turbulence. NOTE: Additional info on XC2 at SIV HERE.